Oh perfect — first impression, “The Ladybug house goes for a spin on the ice.” But that’s silly of course — it is just so delightful, a little house on skates, reminds me of Baba Yaga, remember her? Definitely a fairytale feeling about this little mobile fellow, though I suspect it’s in fact a fishing hut? Or???? 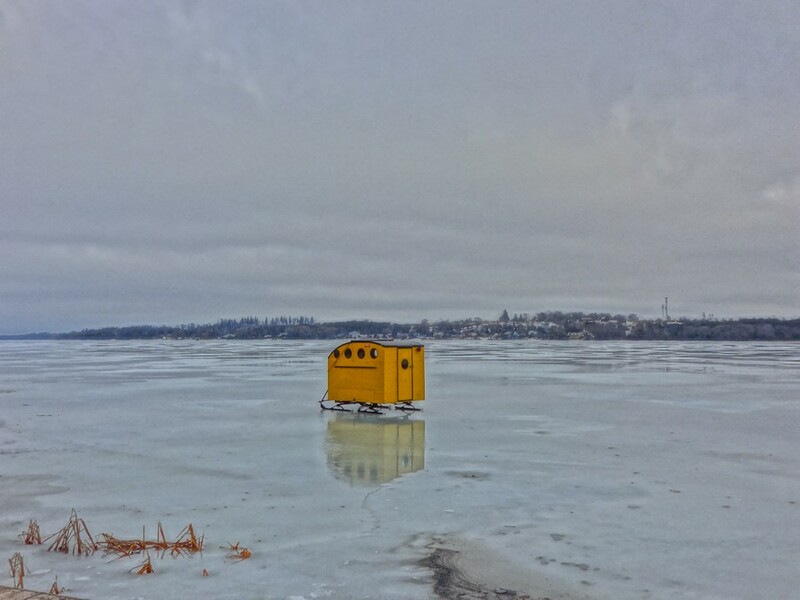 I love its brilliant golden orange and its reflection in the midst of this grey and icy scene. Spectacular … Ice fishing hut extraordinaire. It looks abandoned … and the ice is melting!!!! Great WW pic, Carin! Would like Bob to do a painting of this . I like it so much . This is worthy of publication Carin – it is so wholly Canadian and spectacularly taken. I would love to see it framed on the wall – of an art gallery – or anywhere.